A “mega” dam in terms of economic costs, social and environmental impacts, but with few benefits, mainly for a small elite. The proposed “mega-dam” Jalaur River Multi-Purpose Project Phase II (JRMPP) may be termed “mega” due to its economic costs, social and environmental impacts and potential for environmental disasters; but it is a small dam project in terms of irrigated area and production capacity of only 6.6 MW. The project has received therefore large critics and protests, and is alleged to be likely related to corruption and private interests, rather than to the development of the region . 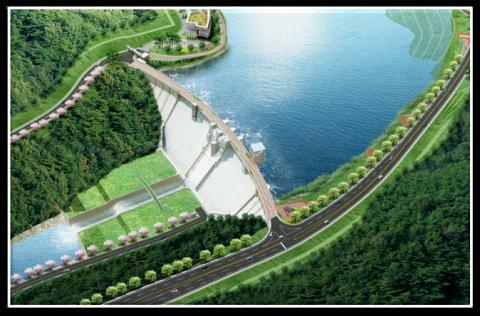 The dam is a joint project of the Philippine and Korean government and the Korean Export-Import Bank (Exim), carrying a project investment of 11.212 Billion Philippine Pesos (around 250 million USD) , driven by Senator Franklin Drilon, who plays a key role in the project . The Memorandum of Understanding (MoU) between these involved parties was signed on December 20, 2011 . (The JRMP Phase 1 project was a quite different project, in which four national irrigation systems were rehabilitated under World Bank funding, during 1977 and 1983. The second phase has never materialized due to its unacceptable low economic returns .) The reservoir would hold around 197 million cubic meters of waters, with a dam up to 102 meters . Despite its high costs and large social and environmental impacts, it has a comparatively small planned electricity production capacity of only 6.6 MW [1;12]. The dam was initially planned to serve all-year long irrigation of 32,000ha of agricultural land, and to supply water to households and businesses . However, 22,340 hectares of the 32,000ha are already irrigated by existing irrigation systems; hence the real added irrigation area would be only 9,500ha . 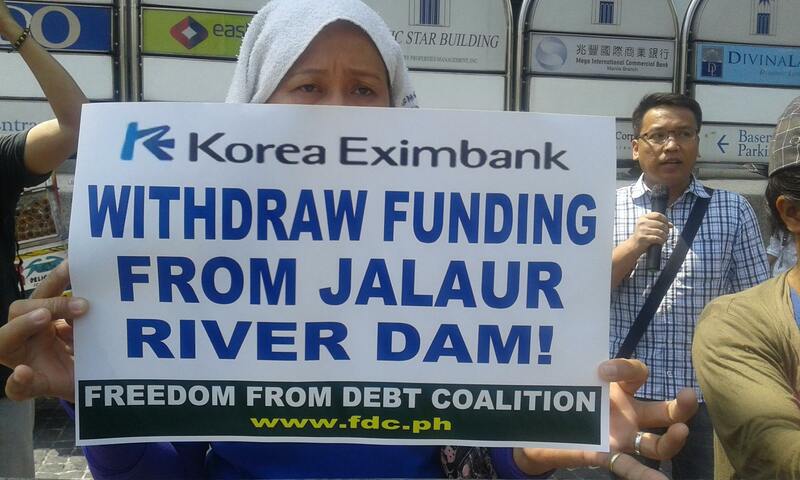 The dam was reported to be partly financed by the Disbursement Acceleration Program (DAP), which has recently been declared as unconstitutional by the Supreme Court, due to dubious financial issues and potential abuse for bribery [1;4]. The project is strongly motivated by Senator Franklin Drilon . A PHP 8.95 billion (around 200 million USD) bank loan would come from the South Korean government through the Export Import Bank of Korea . The remaining costs would be covered by the Philippine government . Various contractors are reported to be involved in the dam construction; among them is the Newington Company . While the government claims to produce 17,000 local jobs during the construction phase , hence temporarily, around 17,000 indigenous people will be needed to be displaced, losing their current livelihood and culture forever . Some tribes started to be divided over the issue, whether to accept adequate compensations, or whether to resist displacement . 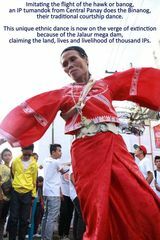 Located on ancestral lands of indigenous communities, the Memorandum of Agreement (MOA) for the feasibility studies was signed without knowledge of all indigenous community members, and the results of the feasibility study were not presented to the community. The proponents were further alleged of bribing indigenous leaders, offering services for their consent, which is contrary to the established free prior informed consent (FPIC) procedure . Several groups, such as AGHAM (Advocates of Science and Technology for the People), conducted investigation missions to assess the project conditions and impacts. 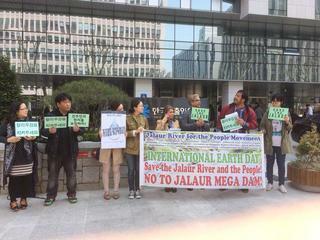 They found that the lives and livelihoods of indigenous people, which were not properly consulted in the FPIC process and project development, would be drastically affected following the dam construction of the project, as the Jalaur dam would require flooding and displacement of 18 indigenous villages [4;5]. Compensations offered for crop loss and displacement have not corresponded to the actual compensations received , or were completely absent . Water, now freely used by the local inhabitants, would become a pricy commodity, controlled by corporate interests . Moreover, the studies emphasized the lack of assessments of how the dam would respond to natural disasters such as earthquakes and floods, particularly as being located on “an area with a series of faults and fractures” [4;7]. The potential breaking of the dam, feared due to its geological unstable location, would cause a massive flooding of the downstream cities Passi and Iloilo . Several strong earthquakes, up to magnitudes of 9 and 8 were registered in the past in the region, known to be prone to earthquakes and landslides . Moreover, large parts of bio-diverse habitats, currently covered by forests and home to several endangered species, would be flooded . The upstream reservoir would convert a unique ecosystem, home to indigenous communities, into a large artificial lake and potential breeding spot for diseases , as well as into a significant source of greenhouse gases . In summary, the dam would threaten people, wildlife and increasing the risk of environmental disasters [4;5]. 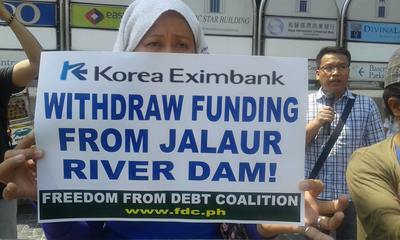 There is large cross-sectoral opposition to the dam, involving several different protest actions. Activists stormed the local Exim Bank office, demanding withdrawal from the controversy project . A petition for Writ of Kalikasan (comparable to an environmental protection order) was submitted by a former congressman; however it was rejected . The congressman further was reported to have funded a rally against the dam . Several advocate groups, such as AGHAM and Kalikasan PNE reiterated their calls to stop the Jalaur River Multi-Purpose Project Phase II (JRMPP) due to social and geological issues, calling for a full investigation of the potential impacts of the dam [4;5]. A large coalition of local groups presented alternative reports on the impacts , as, in their words: “We need to defend and protect our waters, our environment where our lives anchored on it [..]. 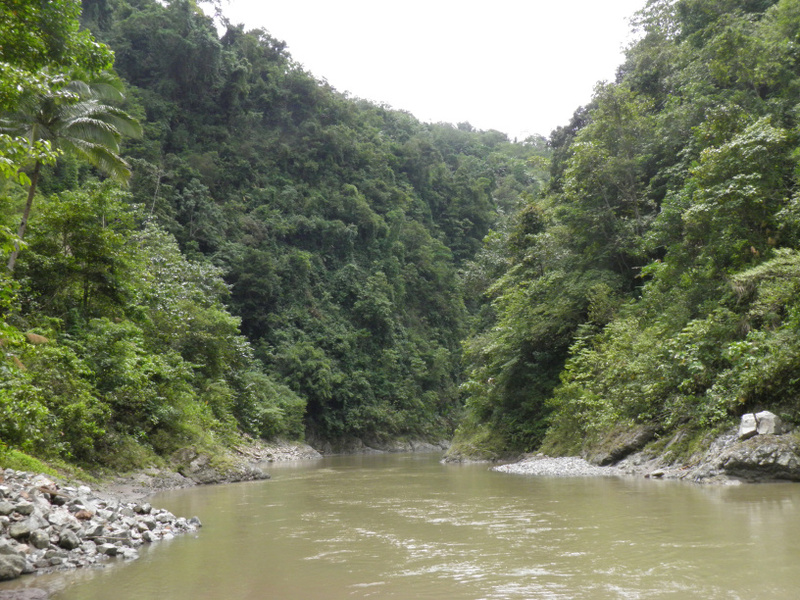 This environmentally disastrous and monstrous project must be stop!” . Construction start was report to be scheduled to November, 2015 . Project Details Project investment of 11.212 Billion Philippine Pesos (around 250 million USD) . The Memorandum of Understanding (MoU) between the involved parties was signed on December 20, 2011 . The reservoir would hold around 197 million cubic meters of waters, with a dam up to 102 meters . Ssmall planned electricity production capacity of only 6.6 MW [1;12]. The dam was initially planned to serve all-year long irrigation of 32,000ha of agricultural land, and to supply water to households and businesses . However, 22,340 hectares of the 32,000ha are already irrigated by existing irrigation systems; hence the real added irrigation area would be only 9,500ha . Development of Alternatives As published by a coalition of local groups opposing the project . It poses great danger to the lives and livelihood of affected communities upstream and downstream of the project. It violates the indigenous people’s right to give or deny consent to projects in their ancestral domain and dislocates a big number of indigenous families . The tremendously large amount of public capital investment does not justify the avowed benefits and is fraught with risks. It plans to privatize water, a very important common resource which is part of our national patrimony. Build small dams and rehabilitate existing irrigation systems which are less risky. Provide assistance of farm inputs, equipment and credit facilities to farmers. Rehabilitation and improvement of flood control measures in flood prone areas. We support the Bayan Muna House Resolution No. 323 titled RESOLUTION FOR THE COMMITTEE ON NATURAL RESOURCES TO CONDUCT AN ONSITE INVESTIGATION, IN AID OF LEGISLATION, ON THE VIABILITY AND DISASTER VULNERABILITIES OF THE JALAUR RIVER MULTIPURPOSE PROJECT STAGE II (JRMP), TO BE SITUATED ON TOP OF THE WEST PANAY FAULT WHICH IS AN ACTIVE FAULT AND THUS THREATENS THE LIVES AND LIVELIHOOD OF THE PEOPLE AND OTHER AFFECTED COMMUNITIES IN THE EVENT OF A MAJOR DISASTER, filed on September 24, 2012." Why? Explain briefly. It seems that the project will go on.